As I’ve yet to see any filmed version of the Dumas novel, I thought it best to start with this one, the first talking edition of the film from a director most history buffs tend to associate with the horror film, James Whale. Whale will forever be identified with both Frankenstein and it’s follow up, The Bride of Frankenstein. For those who may not be familiar with this classic tale, it utilizes the plot device of twins separated at birth and the eventual struggle for the throne of France. The good twin vs. the evil one. In 1638 Paris, twin sons are born to King Louis the 13th portrayed by Albert Dekker. His confidantes think it best that one son be presented to the public while the second be exiled in the care of Warren William as D’Artagnan and not be told of his true heritage. Two men know the truth besides the King and Queen and they will engage in a battle of wits for the remainder of the film as if they’re playing a high stakes game of chess moving pawns about the board. Joseph Schildkraut and Walter Kingsford will play them and succeed in adding to the film’s overall enjoyment. 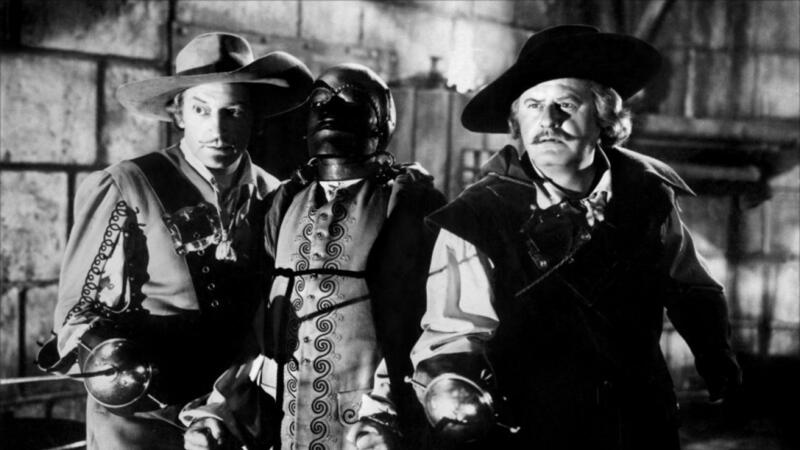 With the passage of time, Louis Hayward steps into the dual role of an evil, down right creepy King and the carefree musketeer in waiting raised by the four famed swordsman of literary fame played by William, Alan Hale, Miles Mander and Bert Roach. The chess game begins between Kingsford and Schildkraut when evil King Louis at Schildkraut’s urging sends a military patrol to the home of William and his friends to arrest them and the good twin Louis with the intention of hanging them all for tax evasion. Kingsford will have to think fast to save the lives of the patriots and the twin brother. When he suggest that one of the captured men looks like the King, evil Louis puts his doppelganger to use on information supplied by torturous means that an assassination attempt on the King is to be carried out. 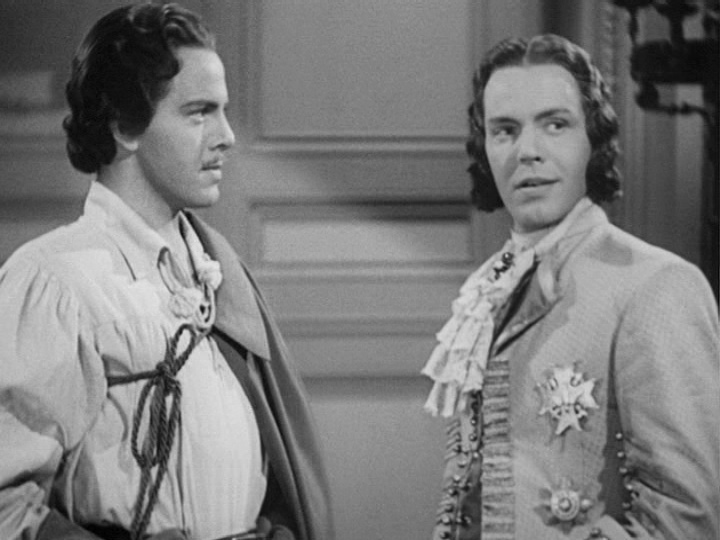 When the good Louis Hayward defends himself in the attempt on his life, rather than killing his subjects who lead the revolt he begs to know the reasons why and captures their hearts with his words and wisdom. 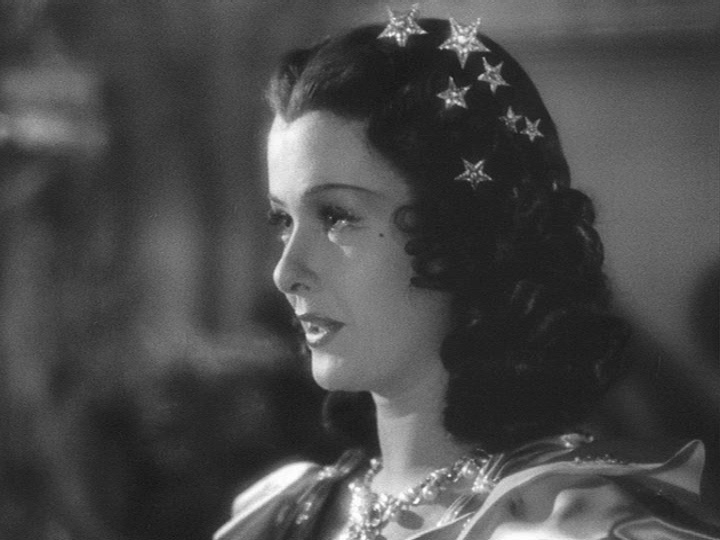 While this is going on the lovely Joan Bennett has come to France as a Spanish Princess to be made Queen in a marriage of political reasons. 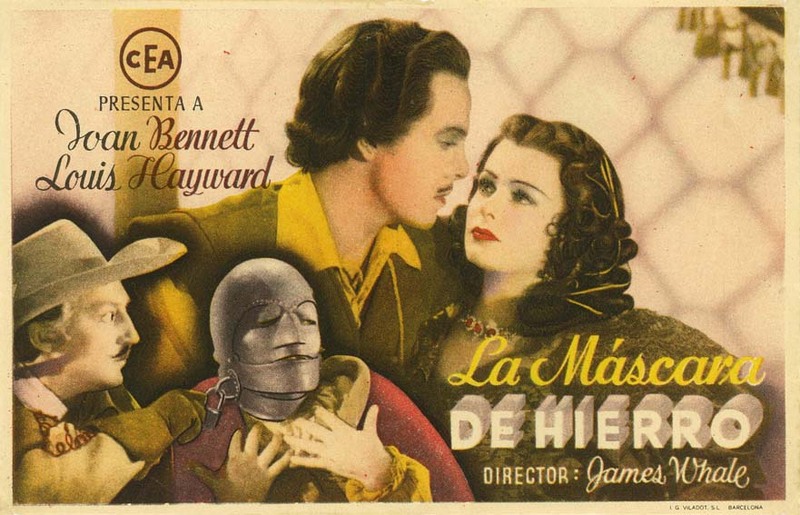 She detests the crazed Hayward who reminds me of Sam Jaffe’s absolutely wired madman of Royal nobility opposite Marlene Dietrich in The Scarlet Empress. Have to wonder if that performance had any effect on just how Hayward plays it here. What Miss Bennett can’t yet figure out is why Hayward is so vile one moment and the very next is holding her hand and causing her heart to melt. While her emotions are being tossed about, the court of intrigue continues in the chess game between scheming Schildkraut and patriot Kingsford. 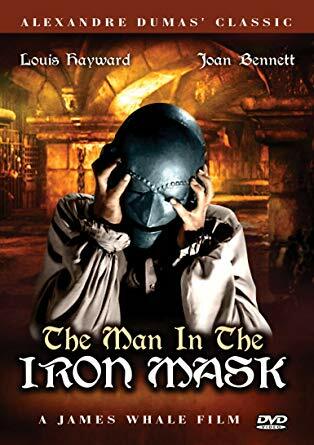 When evil King Hayward decides to send his look-a-like to the gallows, Kingsford is left no alternative but to reveal the identity of the young man as the heir to the throne and brother to the King. 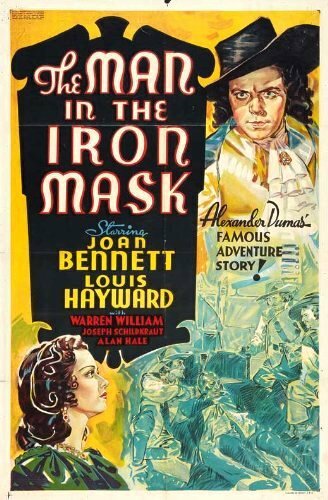 Still to come is plenty of swordplay, the four musketeers, torture chambers and of course an Iron Mask. All of it in the spirit of great on screen adventure and entertainment. I enjoyed this film immensely and still found myself wishing for a lavish color production, maybe from WB with Errol and Olivia joined by Basil, Claude and maybe even Lionel Atwill or Henry Daniell. Is that so wrong? Certainly it’s unfair to the film Whale delivered to audiences of the day which proved to be well worth the price of admission. One thing I would liked to have seen is a little more of Warren WIlliam as D’Artagnan. William was well suited to the role and brought an extra spark of life to the proceedings when on camera. On the other hand the always welcome Alan Hale really didn’t have much to do here so unlike his pairings with Errol Flynn, I found him underused with little opportunity to shine. Long before Leonard DiCaprio took on the tale of twins separated at birth, William Bakewell played the parts in the 1929 silent version of the Dumas story. More importantly, silent screen icon Douglas Fairbanks played the part of D’Artagnan in the film directed by the prolific Allan Dwan. Richard Chamberlain would also give the dual role a go with Louis Jordan as the Musketeer in the 1977 made for TV version of the story. Be sure to check this one out when the opportunity surfaces either thru TCM or by grabbing a copy on DVD from Hen’s Tooth Video. Thank you for your review, now I’m curious to watch the movie! And the anecdote on Peter Cushing… simply great! Have fun and keep your eyes open to spot the handsome youngster who will go on to be the most beloved member of the cast. Not seen this one yet. Looking forward to catching up with it at some point. I quite like the 1977 TV version, which starred Richard Chamberlain, Louis Jourdan and Patrick McGoohan.